What makes KDV Brink so special? 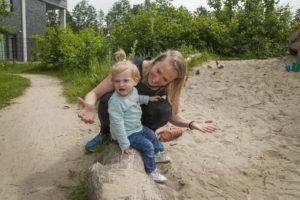 Brink Nursery is situated in the Middenhoven district of Amstelveen-Zuid. It borders on a lovely park and is just a stone’s throw from the tram stop for line 51. Brink After School Care is located in the same building and we work closely together. 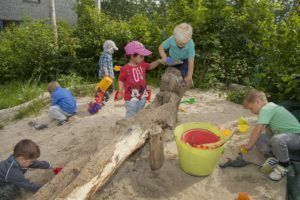 We play outdoors a lot in our special and exciting natural garden at the Brink nursery. 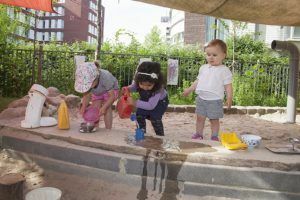 We have a water area, lots of hiding places and sunken sandpits so your child can get in and out easily. The garden means your child gets every opportunity to explore, discover and be physically active. KDV Brink has a baby and toddler group and four vertical groups.